Active galactic nuclei — the growing supermassive black holes at the hearts of massive galaxies — are a puzzling element in galaxy evolution. These monsters ‘feeding back’ energy and momentum into their surroundings are thought to play a crucial role in shaping a galaxy, but the exact nature of how and what they do to their host galaxies is still rather controversial. They could be a mechanism for shutting down star formation and preventing galaxies from growing too large — an effect called for by cosmological simulations, which require this negative AGN feedback to reproduce the observed galaxy luminosity function. However, there is also evidence for positive AGN feedback, in which star formation is enhanced by AGN activity. Figure 1. 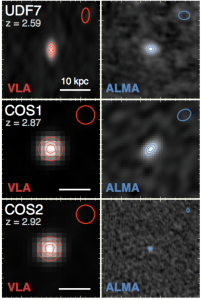 Observations in the radio (VLA, left) and submillimetre (ALMA, right) of three of the galaxies in the sample. The red and blue ellipses in the top right corners show the beam size. From Figure 2 in the paper. The authors of today’s astrobite are not as concerned about how AGN affect the star formation in their hosts, as where these two processes are happening. They exploit the highest resolution data available to spatially resolve the regions of star formation and the location of the accreting black hole. The first challenge in a study like this is finding AGN. The black hole itself is usually embedded within a thick obscuring region of dust and gas, and so much of the emission that we might hope to identify them with is absorbed. 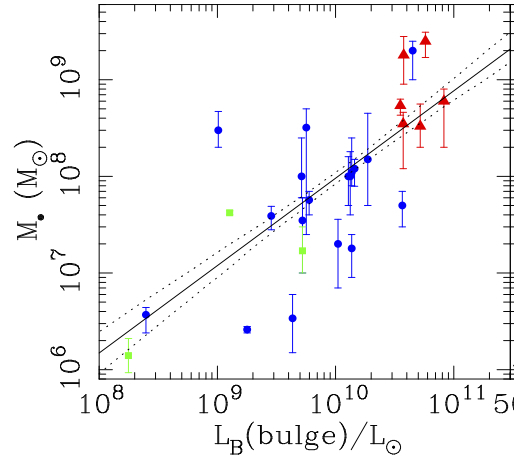 The authors identify AGN by their radio signature using the Karl G. Jansky Very Large Array (VLA), finding sources that have an excess of radio emission above what would be expected from star formation alone. Radio frequencies aren’t absorbed by dust and gas so can be detected in the heart of an AGN, and the resolution achieved by using the VLA allows for milli-arcsecond precision locating this core radio emission. This produces a sample of six radio AGN at high redshift (between z = 1.29 and z = 3.83). To locate star-forming regions in the host galaxies of these AGN, the authors use data from the Atacama Large Millimetre Array (ALMA). This interferometer has revolutionised millimetre and submillimetre astronomy, allowing us to probe the low-energy universe to super high resolution — whether it’s in nearby protoplanetary disks, or in the most distant galaxies in the universe. Here, ALMA observations probe the emission from cold dust heated by newly formed stars. Since this is relatively uncontaminated by emission from the much warmer dust of the AGN torus, it is a good tracer of star formation in distant galaxies. Like the VLA, ALMA’s high angular resolution means that this emission can be localised to remarkably high precision, and for three of the six sources, the resolution is high enough to spatially resolve the star-forming region. The radio and submillimetre images of these three sources are shown in Figure 1. By combining data from these two high resolution instruments probing different wavelengths, the authors obtain spatially resolved information on two very different physical processes. The result is shown in figure 3 — they find that growing supermassive black holes are embedded inside regions that are rapidly forming stars. In fact, they are able to pinpoint the locations of two processes to around 100 parsecs — which is incredibly precise, bearing in mind that these galaxies are in the early universe at distances of tens of billions of light years (that is, comoving radial distance, as calculated using the cosmology assumed by the paper and this cosmology calculator). Figure 3. Close-ups of central 5 kpc of the three sources from Figure 1, showing the positions of the AGN (red) and star-forming region (blue). The ellipses show the 3 sigma uncertainty on the centroid positions. Figure 3 in the paper. This study is only of a very small sample — three sources, plus three more that need higher resolution ALMA observations to be certain — but provides a proof-of-concept of combining these two instruments to uncover the role of AGN in galaxy evolution. If this turns out to be the case generally, then a period of both black hole growth and star formation as observed here could be the origin of the close relations between massive galaxy bulges and supermassive black holes observed in nearby galaxies. 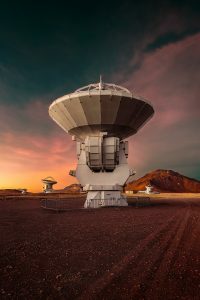 While this still doesn’t tell us everything about how an AGN affects its host galaxy, it could explain the close correlations between galaxy bulge properties and the mass of the supermassive black holes lurking inside them: one of the most significant observations that motivates the search for an AGN — galaxy connection.